Perhaps you've seen Polaris Office on Android or iOS. Now it moves onto the PC. 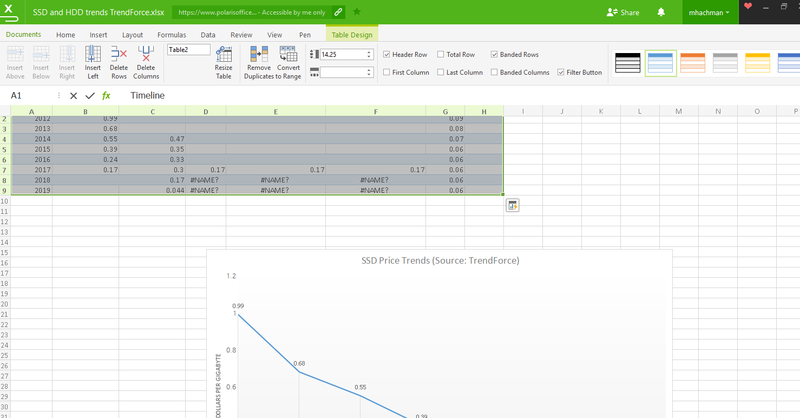 Microsoft Office dominates the productivity space, with a combination of business intelligence, collaboration, and continually updating features. Polaris Office for the PC is for the person who doesn’t need any of that, and just wants to open a spreadsheet at home. Products like LibreOffice, the Zoho suite, and Polaris Office offer basic Office compatibility, forgoing the fancy features for a solid, generally free experience. But be warned: The version of Polaris Office released Tuesday (originally called “PC Office” while in beta) is free up to a point. After that, the software will ask you to sign up for an inexpensive subscription that otherwise feels like Office 365. Some other quirks also bear mentioning. 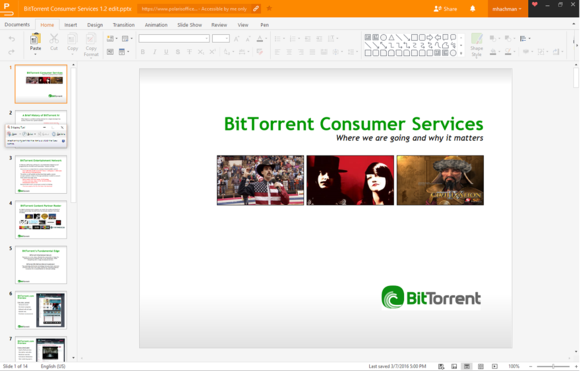 Polaris Office’s Slide, which can open and edit Microsoft .PPT files. Visit an ice cream parlor, and chances are the person behind the counter will offer you a free taste. If you want to actually buy a cone, it will cost you. The same goes for Polaris Office: You can look at any Office document you want, for free. But if you want to use the app on a regular basis, Polaris asks you to pay. The difference is that Polaris charges you on a use basis. You can “use” up to 60MB of files per month on Polaris Office, for free. After that, according to Polaris vice-president of marketing John Lee, a popup will appear, restricting you to viewing documents unless you begin paying $3.99/month or $40 per year. Lee said that of the beta users who've encountered this, between 30 to 40 percent agree to pay. The Polaris Office pricing plans. While 60MB is nothing in terms of photos or apps, it’s still a pretty big number where Word files are concerned—some of my stories are just 20KB in size, and this blog post in Word (the text plus the embedded graphics, but without headers, comments, or embedded scripts) comes out to 279KB. But anything graphic-intensive, such as a Slide document, will eat up that limit fast. From a pricing standpoint, however, it’s a great deal. 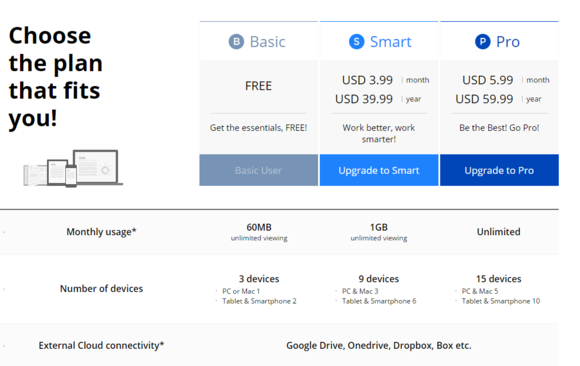 Even the Polaris Office “Pro” version, at $5.99 per month, is cheaper than Microsoft’s Office 365 Personal option, which costs $6.99 per month. Still, you can’t buy a standalone copy of the Polaris app like you can with Office Home and Student 2016 (which costs $150, the equivalent of almost two years of Office 365 Personal). The Polaris Office Word word processing app. 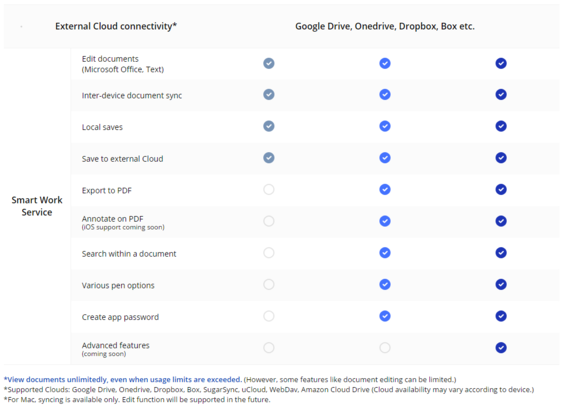 Polaris also offers its own cloud service, called My Polaris Drive, which appears to go hand-in-glove with the pricing restrictions—you should be able store up to 60MB for free. 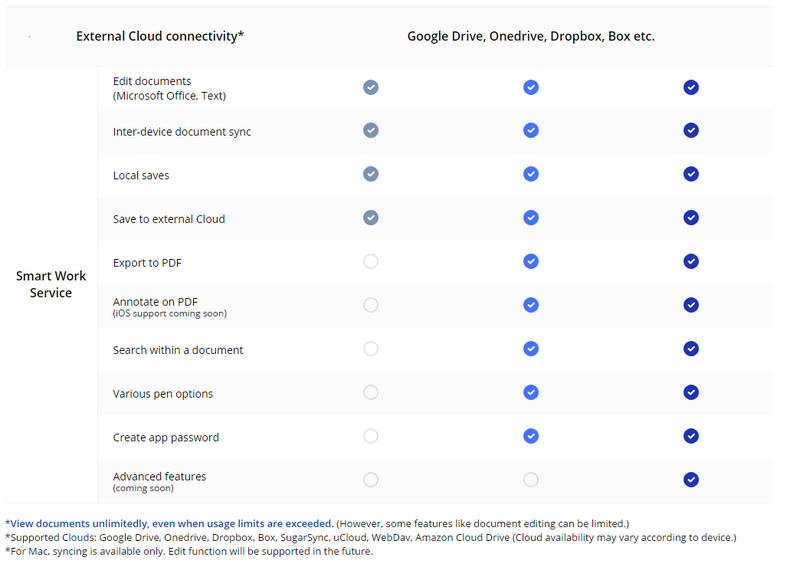 Trusting your data to a cloud service should always give you pause, however, and I uncovered some details in the Polaris Office terms of service that may concern you, specifically Article 9. Clause 3, for example, notes that Polaris may restrict the use of some functions if and when you exceed the storage limit. “If the member’s stored content exceeds the new limit for 30 days, the Company shall delete all the content for that member, including content stored in free storage,” it adds, after pledging to notify you before this occurs. The Polaris Office Sheet app. Keep an eye out for how graphs render in Sheets; I noticed slight differences. According to Lee, those clauses are a legacy of the app’s development as part of Infraware, and will not carry over to the new Polaris Office. Until the company removes the clauses, however, they’re still legally valid. Article 16 also notes that the company may serve you ads as part of the app itself. Article 18 claims that the data the company collects is “only for the purposes of improving the client performance, service, or providing services or technologies suitable to the use environment of the users.” That data includes your name, password, IP address, and Google and Facebook passwords, if you provide them. Fortunately, many of the reasons to consider not using Polaris Office are confined to business and licensing issues, not the apps themselves. Don’t consider this a formal review just yet. However, many of the test documents I uploaded to the Polaris cloud rendered just fine using its Polaris Office app. Some of the more advanced features within Polaris Office are only unlocked via paid upgrades. Polaris has saved some of its more advanced features for its premium customers, but there’s more in the pipeline. The suite includes the ability to open and annotate PDFs, provided you’re willing to pay a bit more. You can share documents right now, via a handy shortcut in the menu bar. In the second half, Polaris promises, Polaris will improve that to include real-time co-editing and handwriting recognition, and even Android Wear and Apple Watch support. In 2017, Polaris says that optical character recognition and handwriting editing are on the roadmap. Beyond that, the Polaris team appears to have a Zoho-style attack plan: group discussions, knowledge sharing, and other features are planned. A big issue for me, however, is that there’s apparently no help function—there’s no menu item that I can find, and tapping “F1” brings up a Like/Suggestion/Problem/See all Reviews menu. And no, the Problem option simply offers a form to report an issue, not research a solution. That means that you’re going to have to dig through the menus to find what you want to do—with none of Microsoft Office’s “tell me what you want to do” prompts. 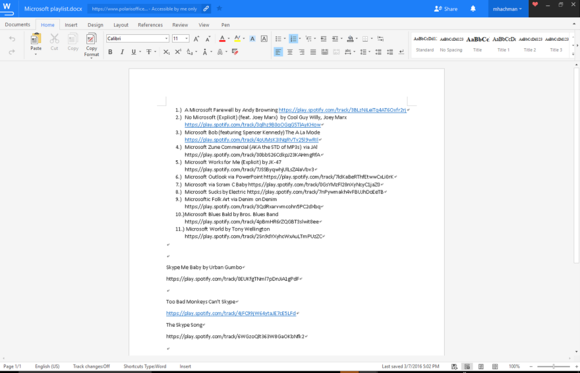 In all, though, Polaris Office seems like a competent alternative to Microsoft Office, and the fact that it’s free to try out allows you a rather risk-free means to evaluate it yourself. Avoid its pitfalls, and realize that eventually you’ll have to pay to use it. 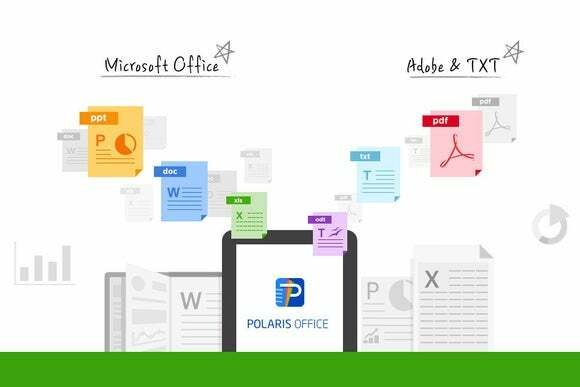 With its cloud support and focused feature roadmap, though, Polaris Office would work best for those users who just want Office’s essentials.